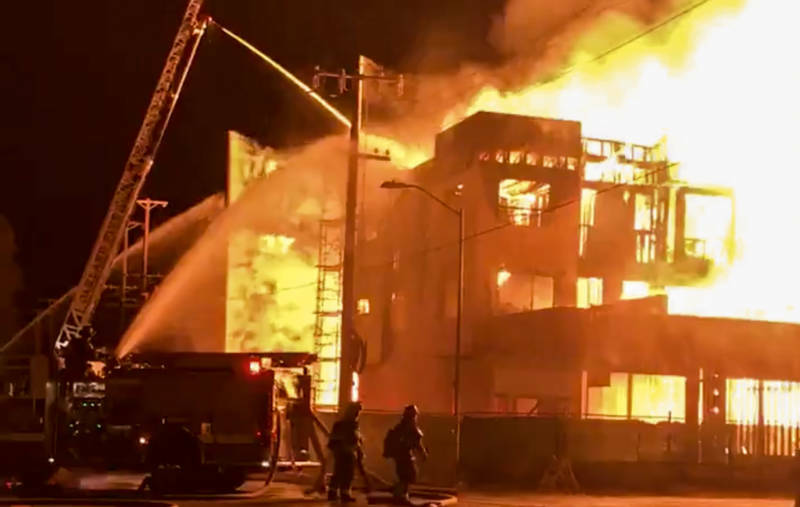 Firefighters Tuesday morning battled a five-alarm fire at a sprawling town home complex under construction in West Oakland that city officials say is under investigation as arson. 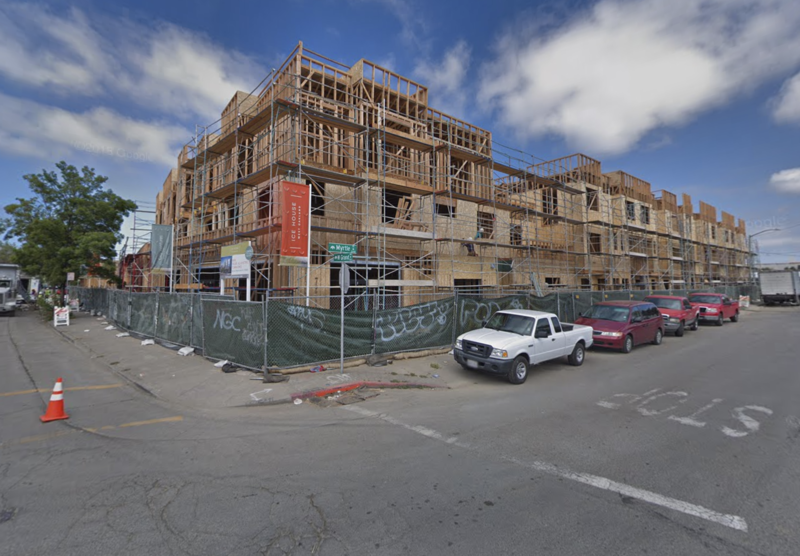 The fire at West Grand Avenue and Filbert Street is the fifth blaze at a residential development in the Oakland-Emeryville area in a little over two years. Investigators have determined three of those earlier fires were deliberately set. "It's definitely concerning," said Oakland Fire Department Deputy Chief Nick Luby, addressing the possibility the fire was arson. The department said it's also investigating a Tuesday morning report of an attempted arson at a second residential building under construction. The fire, first reported at 1:59 a.m., quickly escalated to five alarms because it threatened homes along nearby Myrtle Street, Luby said. As of 9 a.m., the blaze still had not been declared under control, and firefighters continued to dump massive amounts of water on the complex. Embers from the blaze flew east over to Myrtle and ignited at least two smaller fires, including one at an abandoned Victorian home on Isabella Street. Just over 30 minutes after the fire was first reported, the Oakland Fire Department asked Pacific Gas and Electric to turn off electricity in the area, according to PG&E spokeswoman Karly Hernandez. Initially, that meant close to 2,500 PG&E customers were without power, Hernandez said. Mayor Libby Schaaf said at a 9:30 a.m. media briefing that one firefighter was injured in the blaze. Oakland Fire Chief Darin White said the firefighter suffered a leg injury, possibly after stepping into a pothole. Schaaf appealed to the public to call authorities if they had any information concerning arson in the city. "An attack on new housing in Oakland is an attack on keeping families housed in Oakland," the mayor said. "We are in a housing crisis. We need to build housing as quickly and effectively as possible." She also decried "the bigger offense -- the absolute risk of the loss of life in this type of tragedy." Chief White said that the department's fire investigative staff is investigating the blaze as well as a reported arson attempt less than a mile away at a development under construction at 3266 Peralta St. He said the department has already contacted the federal Bureau of Alcohol, Tobacco, Firearms and Explosives for assistance in investigating Tuesday's fire. Deputy Chief Luby said buildings under construction are vulnerable to fire when they’re in the framing stage. “Basically it’s just a big pile of kindling — 2-by-4's, small timber and a lot of air in there that can circulate and get the timber going real quick. And (fire) just grows quite quickly,” Luby said. White told reporters that his crews were having difficulty getting to the active fire still burning in some of the development's buildings. "As you can see, there's still a substantial amount of flame," White said. "Our ladder pipes are not able to actually get directly to the seat of the fire. We're looking at repositioning units and apparatus and maybe deploying hand lines from a point we think is safe." He said he expected the fight to extinguish the blaze to continue throughout the day and that surrounding streets -- including busy West Grand Avenue -- would likely remain shut down well into Tuesday night. The fire destroyed four buildings in the 124-unit Ice House project, according to developer City Ventures. A spokesman for the company said 55 units damaged in the blaze will need to be demolished. City Ventures CEO Phil Kerr said 15 security cameras were installed at the site and a security guard was on duty at the time the fire broke out. "We specifically put cameras in place here, given some of the concern that's been expressed here in Oakland relative to fires," Kerr said. The town home development, built mostly on the block bounded by West Grand, 24th Street, Myrtle Street and Filbert Street, was in different stages of completion. A City Ventures map of the development shows 50 of the development's units have been sold. The real estate site Zillow says homes in the development are priced at $675,000 and up. Kerr said about 40 of the units were scheduled to be occupied by the end of the year. Kendale Price, 32, who watched the fire early Tuesday, said he has lived in West Oakland his entire life and that there's anger in the neighborhood about gentrification and displacement. But he added that's no excuse for arson or targeting new buildings. “Looks like the anarchists probably struck again," Price said. "This is trying to send a message but in the wrong way. ... I’ve seen my neighborhood change right in front of me. Gentrification is a problem, but this is the wrong way to go about it." The fire is the latest in a series of blazes at buildings under construction in Oakland and Emeryville in just 27 months. 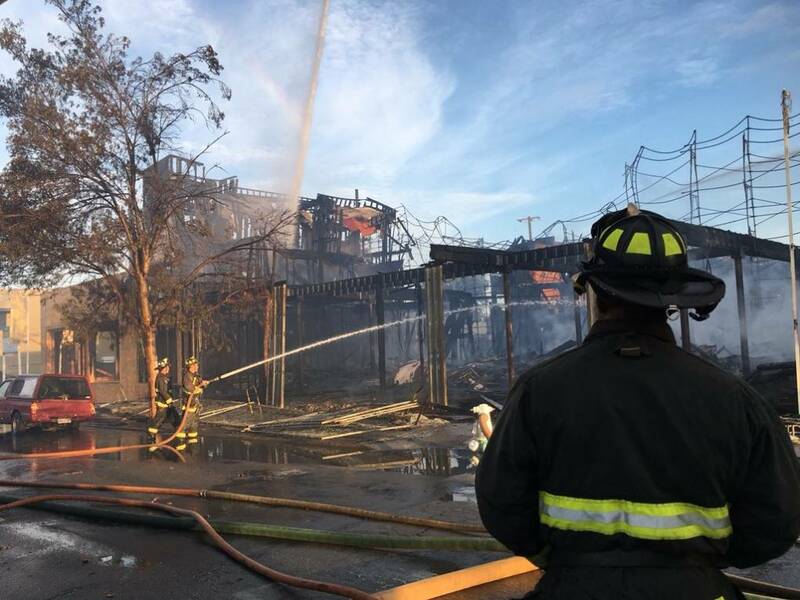 Two arson fires struck a residential housing development near MacArthur Boulevard and San Pablo Avenue at Oakland's border with Emeryville, first in July 2016 and again in May 2017. In October 2016 an arson fire gutted an apartment complex under construction on Lester Avenue east of Lake Merritt. In July 2017 a four-alarm fire gutted a large apartment and commercial building under construction at 23rd and Valdez streets. A month later federal officials announced that they could not determine the cause of that blaze. KQED's Raquel Maria Dillon and Dan Brekke contributed to this report.